This cake was the find of 2008 for me. It was funny though, this recipe was lying around for several months waiting for me to just get on with making it! I didn't think the cake looked particularly interesting and I don't like limes so this cake was purely for my husband and children. Weeeell, guess who ate most of it? Haha yup, it was that good!! 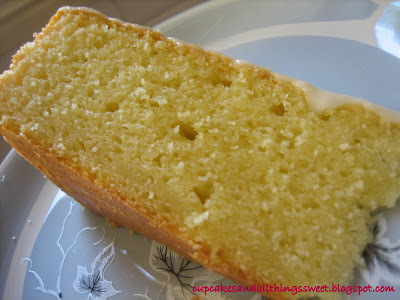 It's like a lemon delicious pudding but in cake form but using limes:) It's really soft and moist in the middle and I love it the best just after the icing sets. It's so nice when it's really fresh. I've tried this recipe using lemons instead of limes but it just didn't taste that good. Maybe limes and buttermilk were just meant for each other. 1. Preheat oven to 170°C. Grease and line a 20cm (base) round cake pan. 2. Using an electric mixer on high speed, cream butter, 1 tablespoon lime rind and sugar in a small bowl until light and fluffy. Add egg yolks, 1 at a time, mixing well after each addition. 3. Transfer to a large bowl. Stir in half the flour. Add half the buttermilk and 1 tablespoon lime juice. Stir to combine. Fold in remaining flour and buttermilk and 1 tablespoon lime juice. Using electric mixer, beat eggwhites in a clean bowl until soft peaks for. Fold into batter. 4. Spread batter into cake pan and smooth surface. Bake for 50 - 60 minutes or until skewer inserted into the centre comes out clean. Cool for 5 minutes in pan. Turn onto a wire rack to cool completely. 5. 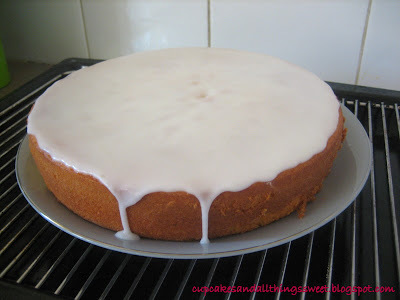 Make lime icing: Combing icing sugar, milk and enough lime juice to form a thick icing. 6. Spread icing over top of cake. Allow to set before serving. Yum. 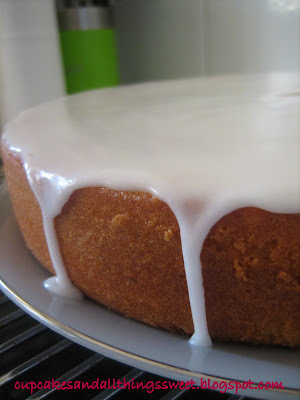 Thick white icing oozing over the edge of a cake does it for me every time! I'm sure this cake really taste good. You can even see the butter in the cake.